Copyright is an important theme throughout this blog. I have used many tools to research the ownership of the Hoyle copyright and have recently "discovered" a new one. This essay will describe the tools giving examples from my research. Some provide a snapshot of ownership at a point in time while others document sales of copyright shares, typically with the price paid, letting us value the copyright at a point in time. Like any historical evidence, there is a random nature to what records have survived and therefore how complete a story can be uncovered. The Worshipful Company of Stationers and Newspaper Makers was the guild of the book trade in the City of London. They maintained a register of books where copyright owners could record their right to print a book. 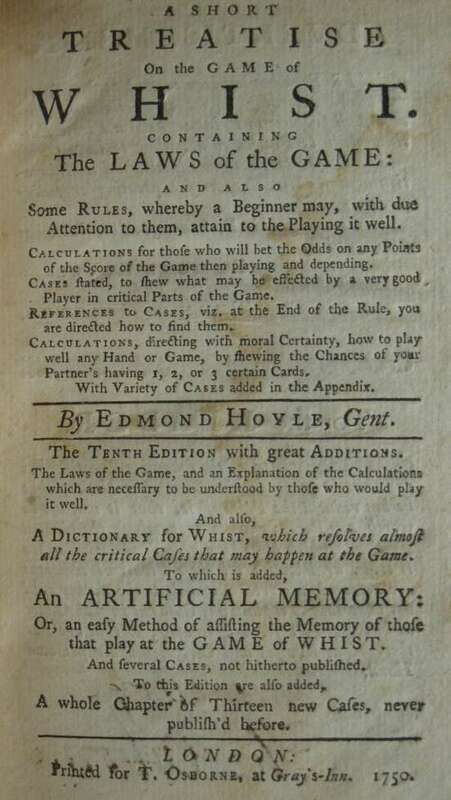 Hoyle entered A Short Treatise on the Game of Whist in the register on November 17, 1742 as the sole proprietor. Hoyle and Cogan jointly entered the backgammon treatise on June 28, 1743 and the piquet treatise on January 11, 1744. Hoyle registered Brag on January 18, 1751. [Aside: the latter two years are recorded in the register as 1743 and 1750--the register uses old style dating in which the first day of the new year is March 25.] His other works were not recorded with the Stationers Company. The imprint of a book frequently provides reliable data on copyright ownership. For example, the first edition of Whist had the imprint "printed by John Watts for the author" and the first collected edition of Hoyle's Games was "printed for T. Osborne." Imprints, however, can be fictitious, as was the case with the 1743 piracies of Whist, and for many of the books published by Francis Cogan. The imprint provides a coarse view of copyright ownership--a book may remain in print for many years during which time the copyright ownership can change. Sometimes, booksellers would go to the expense of reissuing books with new title pages to update the imprint (for examples, see the discussion of The Compleat Gamester, Quadrille and Piquet, and The Polite Gamester), but often the book would continue to sell with the old imprint. Infrequently, at least for the time period I care about, publisher's business records may survive providing evidence of copyright ownership. The essay "Hoyle's Games Improved, Charles Jones (1800)" used business records of the Longman firm to identify the owners and their shares of the copyright for an 1800 Hoyle. At the end of this piece, I will take a second look at that essay and the editions of 1796 and 1800. Throughout the 18th century, London booksellers would hold frequent sales of copyrights and physical books. We are extremely fortunate that so many long runs of these sale catalogues have survived. Better still, they tend to be annotated with information about the purchaser and purchase price. I have discussed these trade sales a number of times--the essay "The Hoyle Copyright in Hoyle's Lifetime" is a good example with some illustrations from the catalogues. Most of the Hoyle sales are for a fractional share of a copyright, providing only transactional information. For example the above essay notes that on April 21, 1763, Henry Woodfall bought two one-sixth shares of Hoyle. Other sources are required to find who owned the rest. When the trade sale offers the full share, the catalogue can provide a complete snapshot of ownership. In my discussion of the 1779 Jones Hoyle, I cited a receipt where bookseller Thomas Payne sold the rights to a book on draughts (checkers) to Thomas Lowndes for inclusion into Hoyle's Games Improved. Similar receipts survive for copyrights sold at bookseller trade sales. For example Lowndes bought a 1/12 interest in Hoyle from a member of the Baldwin family for £22 15s on February 5, 1771. The receipt is useful because if the catalogue for that trade sale survives, I have not located a copy. Newspaper advertisements for books typically include imprint-like information so that the customer can learn where to purchase the book. It had not occurred to me until quite recently to compare advertisements with the imprints of books they advertise. When copyright ownership changes while a book is still in print, it is possible to detect the change in advertisements even if the book was not reissued with a cancel title. This provides a less coarse view of copyright ownership than imprints. 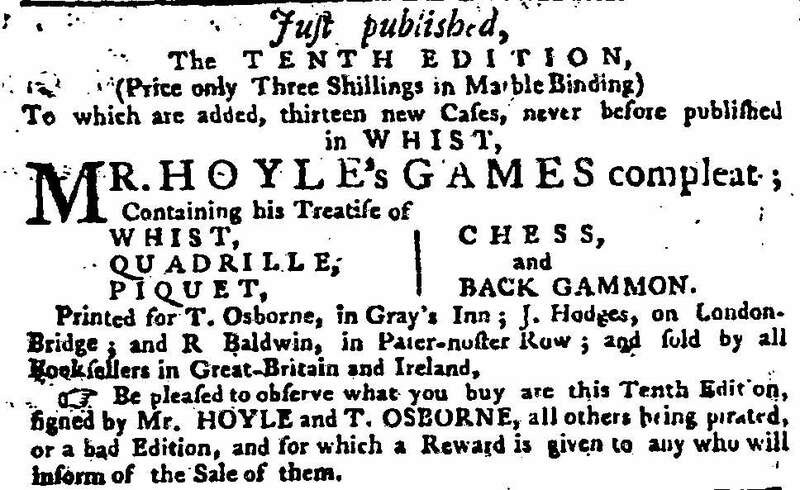 An interesting example is the "tenth" edition of Hoyle's Games printed for Thomas Osborne, a book which I discuss in "Reissues of Mr. Hoyle's Treatises (1748-1755)." The book was first published in 1748 as an "eighth" edition and reissued by Osborne as a "tenth" in 1750 (pictured at left), remaining in print through 1755. Some advertisements from December 1755 such as the one pictured at left offer the "tenth" edition printed for T. Osborne, J. Hodges, and R. Baldwin. There are no copies of the "tenth" with Hodges or Baldwin on the imprint. 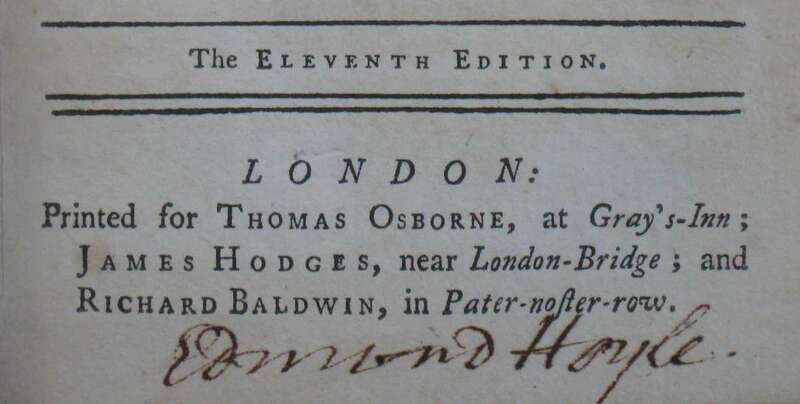 When the "eleventh" edition was published in December 1756, the imprint did include Osborne, Hodges, and Baldwin. What we learn from the advertisements is that Hodges and Baldwin invested in the Hoyle copyright at least a year earlier than one can infer from the imprints. A second example applies to the Charles Jones Hoyles. In my essay "Hoyle's Games Improved, Charles Jones (1800)," I noted that Longman was not on the imprint of the 1796 edition, was in 1800. Because the Longman business records survive, we have much financial detail about the 1800 Hoyle. It turns out that advertisements from December 1798 mention the Longman firm, so they must have purchased a share of the Hoyle copyright two years before the 1800 edition was published. Those advertisements sent me back to the Longman archives, looking for more details about the 1796 edition. I found that Longman owned a 1/24 share of the Hoyle copyright, although the records did not list the other owners and their shares. The records indicate a print run of 3000 copies, which at the sale price of 3s. 6d. meant £525 in revenue. Expenses totalled £125, primarly paper (a bit more than £70), printing (£28 12s. ), and advertising (almost £21). So, I've discovered that newspaper advertisements can identify changes in copyright ownership that are more fine-grained than imprints. This is not a terribly profound discovery, I suppose, but it gives me another tool to explore the Hoyle copyright. I have nearly 500 advertisements for Hoyles and wish myself happy digging! Excellent research and an interesting read.